'Mystery Box'? 'Grab Bag'? 'Random'? All of the above! 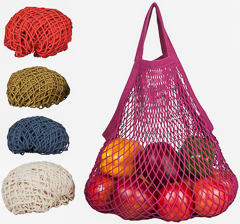 This set of 5 String Bags is drawn from a pool of string bags containing various colors and handle lengths. You may get all the same color and handle length or a variety. Every bag is an ECOBAGS® Classic String Bag™ that expands to hold more than you think and compacts to fit in your pocket, purse or glove compartment.